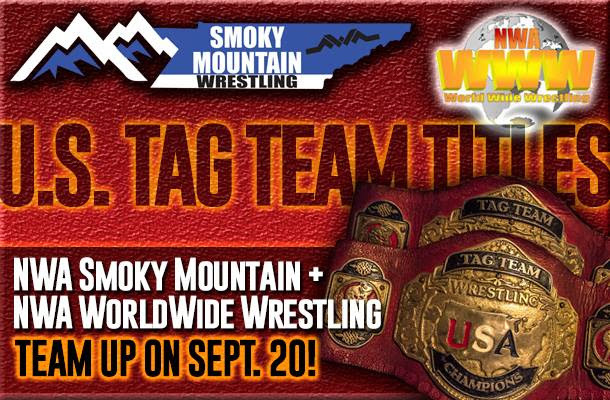 East Tennessee’s NWA Smoky Mountain and NWA World Wide Wrestling out of North Carolina will team up on Saturday, September 20 to present a tournament to crown new NWA United States Tag Team Champions. On that night both promotions will each hold their own part of the tournament. NWA Smoky Mountain will present the Morgan Memorial at the Civic Auditorium in Kingsport, TN and NWA World Wide Wrestling will present the Crockett Cup at Castle Hayne Baptist Church in Castle Hayne, NC. The two winning teams will face off of on October 11 in Kingsport, TN with the victorious team being awarded the NWA United States Tag Team Titles! - Illuminati’s Chris Richards & The NWA World Junior Heavyweight Champion, Chase Owens. The rest of the field will be announced soon! Both events will feature singles action as well. NWA National Champion Lou Marconi will defend against the former champion, The Tokyo Monster Kahagas in Castle Hayne, NC. The NWA Smoky Mountain Title will be on the line Kingsport, TN as Jason “The Gift” Kincaid face off with a challenger that has yet to be announced. For more information on NWA World Wide Wrestling and the Crockett Cup Tag Team Tournament on September 20 in Castle Hayne, NC visit them online at www.WorldWide-Wrestling.net. For more info on NWA Smoky Mountain visit them atwww.NWASmokyMountain.com. Tags: NATIONAL WRESTLING ALLIANCE, NWA, Smoky Mountain Wrestling.